Home News Subdued McIlroy Insists Sawgrass Success Merely A Career Journey Step In The Right Direction. Subdued McIlroy Insists Sawgrass Success Merely A Career Journey Step In The Right Direction. 1 month ago by Fatiha Betscher Comments Off on Subdued McIlroy Insists Sawgrass Success Merely A Career Journey Step In The Right Direction. It clearly was a day for champagne showers and maybe making a splash diving into the water surrounding the18th green at TPC Sawgrass. Not for new Players Championship champion, Rory McIlroy. 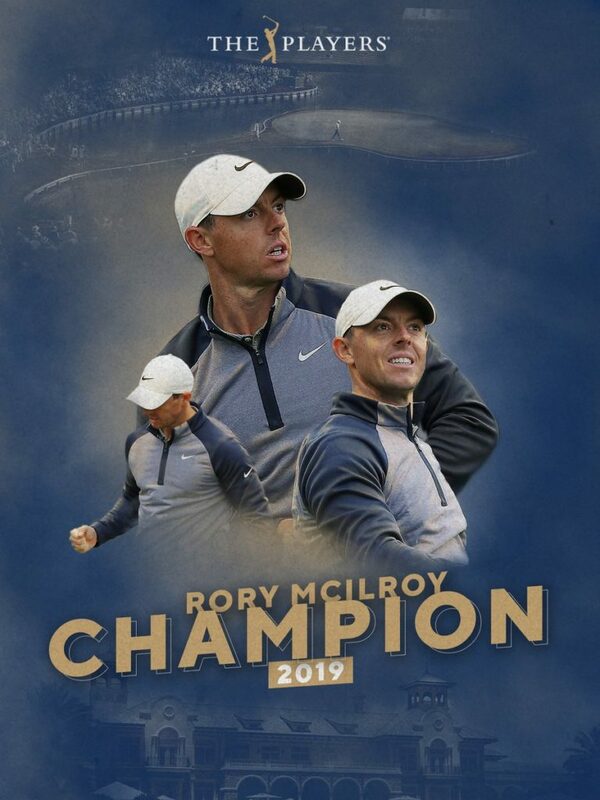 Of course, McIlroy was thrilled to become a Players champion in brilliantly lighting-up the course on a dull and overcast day to end a year-long winless drought by posting a final round 70 to win by a shot with a 16-under par tally. The new World No. 4 had captured a 15th PGA Tour title and a 24th pro career success. McIlroy also banked the richest first prize cheque in golf, a $US 2.25m victory cheque. It also was St. Patrick’s Day and a day across the globe for festivity and merrymaking though McIlroy was not about to down a pint of Guinness. No, McIlroy had walked triumphantly onto the 72nd green acknowledging the applause and then headed to the scorer’s hut with the chat of ‘Rory, Rory, Rory’ ringing in his ears. He was handed a gold, new-look Players Championship trophy that matched the gold coloured soles of his Nike gold shoes. No, this is a new-look McIlroy and one who is clearly benefitting from the many consciousness-theme books he’s been reading. This also is a soon-to-be 30-year old very much as ease in welcoming a latest accolade and in what McIlroy again reminded us is his journey. “I desperately wanted to win today, but it’s just another day. It’s just another step in the journey,” he said. “So it doesn’t change anything. It doesn’t change who I am. It looks great on my resume. I’m very happy about that. It’s another step in the right direction. But that’s all it is to me. It’s a huge tournament to win. I’m very proud and very honoured, but it’s just a step in the right direction. “Everything was in a really good place, and that’s why I was just preaching patience, and it was just a matter of time. Easier said than done, obviously, but I think having that attitude let me go out there this week after the disappointment of Bay Hill on Sunday, and I said, that’s the great thing about golf, you can get straight back on the horse and you have another opportunity the very next week, and not a lot of sports or sports people have that luxury. McIlroy was quizzed what has been instrumental in the change in his make-up but then those who have worked closely with the four-time Major winner in recent years, the answer lies in his better understanding of consciousness. “I think it’s a lot of things. It’s, I think, maturity. I think it’s been having a focus over the last six or seven months on my attitude, especially my attitude to golf, and not letting golf define who I am as a person, trying to keep the two things very separate, because one thing that I used to do in the past is I’d shoot — I’d let what I shot that day influence who I was or my mood or — and to try and keep those two things very separate is something I’ve worked hard on because who I am as a person isn’t who I am as a golfer, and it took me a while to get to that point where I realized who those two people were,” he confessed.